QR Codes all over the place! Whereas the Pepsi QR code merely gives a link to the Pepsi site, the Wolverhampton code provides details of the lecture, a link for further information on the speaker, and even includes information about how to scan the QR code (taking advantage of the level of error correction in QR codes). 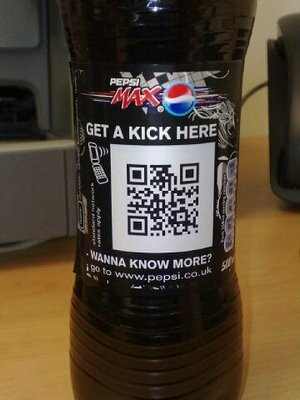 Could it be that Wolverhampton’s School of Art & Design have more successfully utilised QR Codes than the multi-billion dollar PepsiCo?